No. 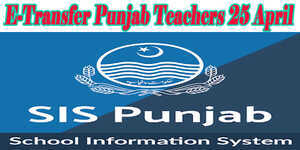 SO(SE-IV)2-50/2015 is issued by Government of the Punjab School Education Department dated 29-11-2017 with respect to Release of Salaries of Educators and AEOs Recruited under Recruitment Policy 2016-17. 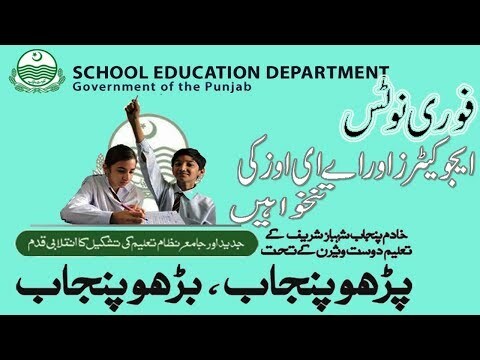 It is submitted to all CEOs District Education Authorities in Punjab. 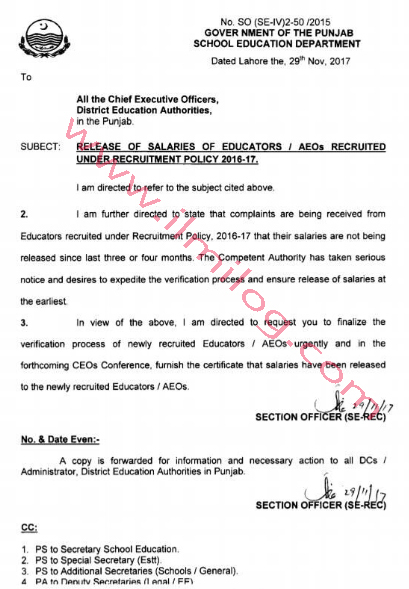 It is coordinated to express that protests are being gotten from instructors enlisted under-enrollment strategy 2016-17 that their pay rates are not being discharged since last three or four months. The equipped expert has taken genuine notice and wants to speed up the confirmation procedure and guarantee arrival of pay rates at the most punctual. In the perspective of the above it is coordinated to finish the check procedure of recently enlisted teachers and AEOs earnestly and in the inevitable CEOs gathering outfit the declaration that pay rates have been discharged to the recently enrolled instructors and AEOs. It is composed to speed up that challenges are being gotten from educators enrolled under-enlistment methodology 2016-17 that their compensation rates are not being released since last three or four months. The prepared master has taken honest to goodness notice and needs to accelerate the affirmation strategy and certification landing of pay rates and no more prompt.